Last Person To Get Smallpox Dedicated His Life To Ending Polio : Shots - Health News In the 1970s, Ali Maow Maalin, a Somali hospital worker, was the last member of the general public to catch smallpox — worldwide. Once recovered, he worked for years to wipe out polio in Somalia. Maalin, called "an inspiration" by world health leaders, died unexpectedly last week. Ali Maow Maalin said he avoided getting the smallpox vaccine as a young man because he was afraid of needles. He didn't want others to make the same mistake with polio. So far, the human race has eliminated just one disease in history: smallpox. But it's on the cusp of adding a second virus — polio — to that list. One special man in Somalia was at the battlefront of both eradication efforts. He died last week of a sudden illness at age 59. Ali Maow Maalin was the last member of the general public — worldwide — to catch smallpox. And he spent the past decade working to end polio in Somalia. World health leaders called Maalin "an inspiration." 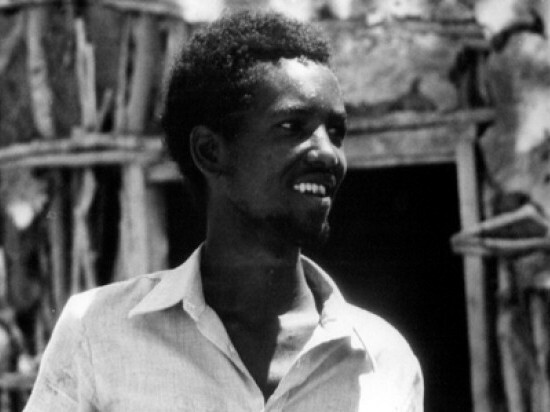 Even in the weeks before his death, he was leading anti-polio campaigns in some of the most unstable parts of Somalia. Maalin's fight against polio began in 1977. Jimmy Carter had just been elected U.S. president. Apple Computer had just incorporated in California. And the world was on the verge of wiping out smallpox. Decades of vaccination efforts had pushed the virus into one last corner of the world: Somalia. Maalin, then a hospital cook near Mogadishu, caught smallpox while driving an infected family to a clinic. He was careful not to spread the disease to anyone. About three years later, Somalia — and the world — were declared free of smallpox. "In that respect, Maalin is extremely important," says Dr. Donald Hopkins, who directs health programs at The Carter Center. "He is an emblem of the global smallpox eradication campaign." After recovering from smallpox, Maalin decided to dedicate his life to eliminating another scourge. "He would always say, 'I'm the last smallpox case in the world. I want to help ensure my country will not be last in stopping polio,' " Dr. Debesay Mulugeta, who leads polio eradication efforts in Somalia, tells Shots. So in 2004, Maalin officially became a polio vaccinator. He organized volunteers, went door to door immunizing children and helped to convince families the vaccine was safe. At the time, vaccinating kids in southern Somalia was a dangerous job. Several militia groups were fighting each other, and some vaccinators were even shot at. Many militia leaders thought the vaccine wasn't safe, so Maalin would share his own experience with smallpox and change their minds. Maalin told The Boston Globe in 2006 that he had several opportunities to receive the smallpox vaccine, but initially avoided it because he was afraid the shot would hurt. "Now when I meet parents who refuse to give their children the polio vaccine," he told the Globe, "I tell them my story. I tell them how important these [polio] vaccines are. I tell them not to do something foolish like me." Such tactics helped Maalin and other health workers stamp out Somalia's polio outbreak in 2005. The country was declared polio-free in 2007. Last year, there were just 223 cases of polio worldwide. Health leaders hope to have that number down to zero by 2015. But this spring, polio began to make a comeback in Somalia. A handful of children were paralyzed by the virus in May; since then, Somalia has recorded more than 70 cases. So Maalin went back to work and started organizing immunization campaigns in one of the most turbulent regions of Somalia. "The area where he worked was not easy because militia controlled access to it," Mulugeta says. On the second day of the campaign, Maalin got sick. "He had a fever," Mulugeta says. "But he didn't give much attention to it." A few days later, Maalin was in the hospital and died July 22. "The hospital said it was complicated malaria," Mulugeta tells Shots. "Ali was such a great colleague. I don't think he went for medical service early enough. He was so busy in the field, so focused on monitoring the campaign."